This topic provides a step-by-step introduction to building, debugging, and publishing a simple .NET Core console application using C# in Visual Studio 2017. Visual Studio 2017 provides a full-featured development environment for building .NET Core applications. As long as the application doesn't have platform-specific dependencies, the application can run on any platform that .NET Core targets and on any system that has .NET Core installed. Launch Visual Studio 2017. Select File > New > Project from the menu bar. 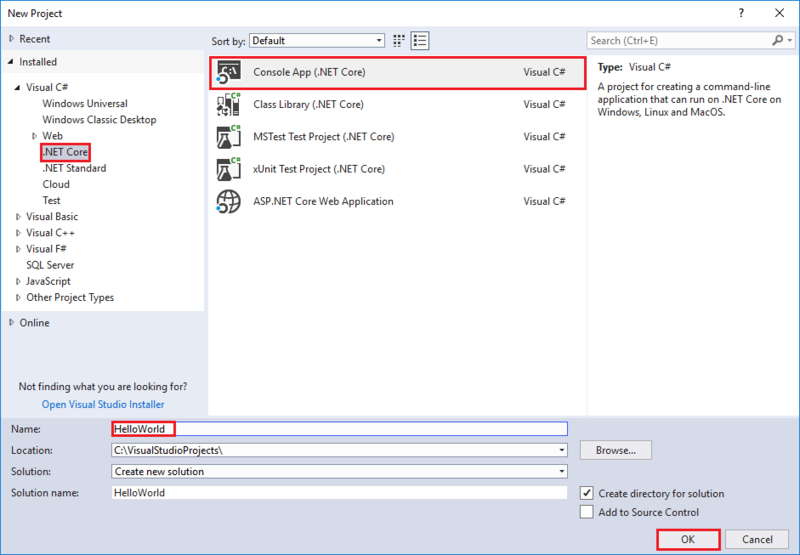 In the New Project* dialog, select the Visual C# node followed by the .NET Core node. Then select the Console App (.NET Core) project template. In the Name text box, type "HelloWorld". Select the OK button. Visual Studio uses the template to create your project. The C# Console Application template for .NET Core automatically defines a class, Program, with a single method, Main, that takes a String array as an argument. Main is the application entry point, the method that's called automatically by the runtime when it launches the application. Any command-line arguments supplied when the application is launched are available in the args array. 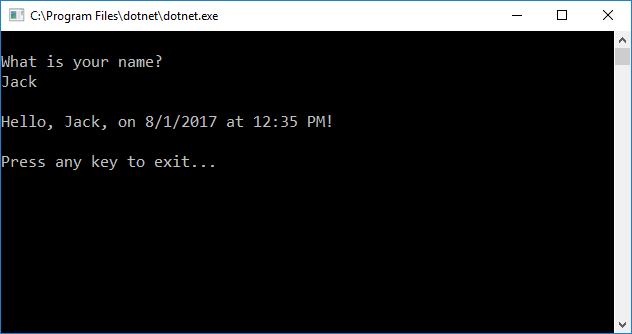 The template creates a simple "Hello World" application. 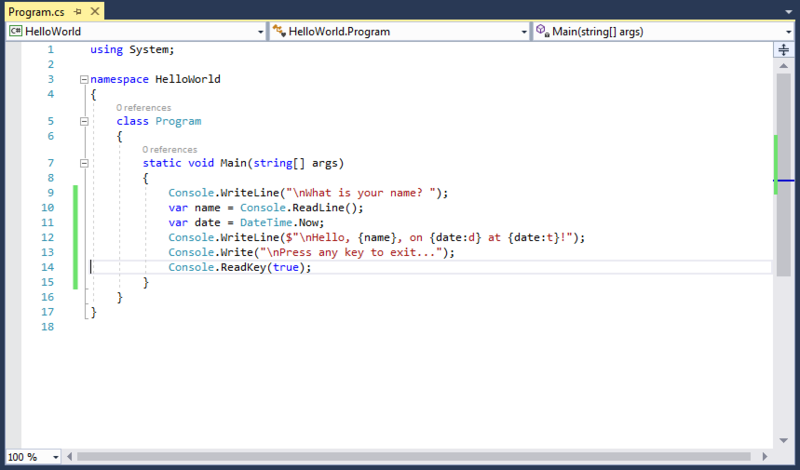 It calls the Console.WriteLine(String) method to display the literal string "Hello World!" in the console window. By selecting the HelloWorld button with the green arrow on the toolbar, you can run the program in Debug mode. If you do, the console window is visible for only a brief time interval before it closes. This occurs because the Mainmethod terminates and the application ends as soon as the single statement in the Main method executes. This code prompts the user to press any key and then pauses the program until a key is pressed. On the menu bar, select Build > Build Solution. This compiles your program into an intermediate language (IL) that's converted into binary code by a just-in-time (JIT) compiler. Run the program by selecting the HelloWorld button with the green arrow on the toolbar. This code replaces the existing Console.WriteLine, Console.Write, and Console.ReadKey statements. This code displays "What is your name?" in the console window and waits until the user enters a string followed by the Enter key. It stores this string into a variable named name. It also retrieves the value of the DateTime.Now property, which contains the current local time, and assigns it to a variable named date. Finally, it uses an interpolated string to display these values in the console window. Compile the program by choosing Build > Build Solution. Run the program in Debug mode in Visual Studio by selecting the green arrow on the toolbar, pressing F5, or choosing the Debug > Start Debugging menu item. Respond to the prompt by entering a name and pressing the Enter key. The Visual C# documentation assumes that you have an understanding of basic programming concepts. If you are a complete beginner, you might want to explore Visual C# Express, which is available on the Web. You can also take advantage of books and Web resources about C# to learn practical programming skills. As an object-oriented language, C# supports the concepts of encapsulation, inheritance, and polymorphism. All variables and methods, including the Main method, the application's entry point, are encapsulated within class definitions. A class may inherit directly from one parent class, but it may implement any number of interfaces. Methods that override virtual methods in a parent class require the override keyword as a way to avoid accidental redefinition. In C#, a struct is like a lightweight class; it is a stack-allocated type that can implement interfaces but does not support inheritance. 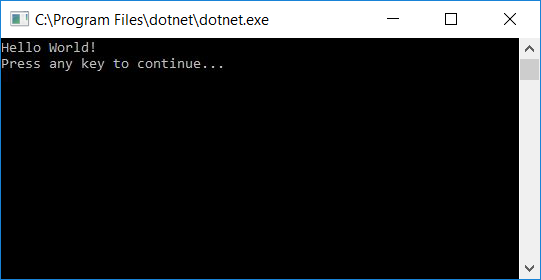 If you have to interact with other Windows software such as COM objects or native Win32 DLLs, you can do this in C# through a process called "Interop." 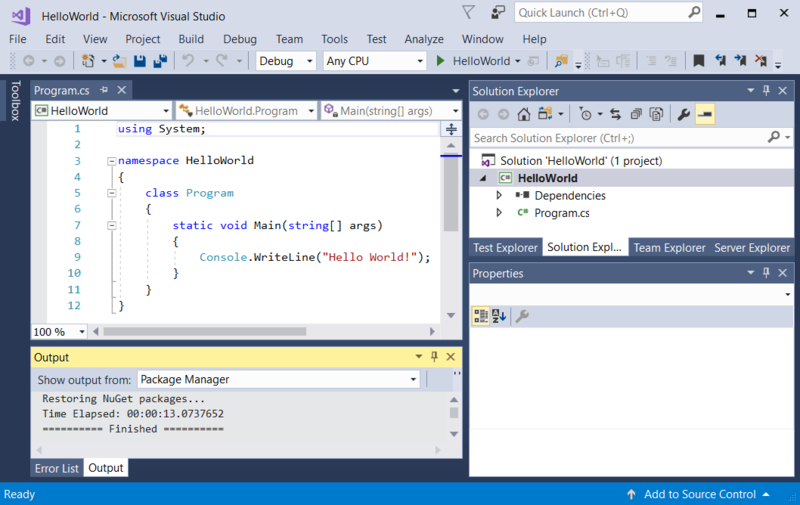 Interop enables C# programs to do almost anything that a native C++ application can do. C# even supports pointers and the concept of "unsafe" code for those cases in which direct memory access is absolutely critical. The C# build process is simple compared to C and C++ and more flexible than in Java. There are no separate header files, and no requirement that methods and types be declared in a particular order. A C# source file may define any number of classes, structs, interfaces, and events. C# programs run on the .NET Framework, an integral component of Windows that includes a virtual execution system called the common language runtime (CLR) and a unified set of class libraries. The CLR is the commercial implementation by Microsoft of the common language infrastructure (CLI), an international standard that is the basis for creating execution and development environments in which languages and libraries work together seamlessly. Source code written in C# is compiled into an intermediate language (IL) that conforms to the CLI specification. The IL code and resources, such as bitmaps and strings, are stored on disk in an executable file called an assembly, typically with an extension of .exe or .dll. An assembly contains a manifest that provides information about the assembly's types, version, culture, and security requirements. When the C# program is executed, the assembly is loaded into the CLR, which might take various actions based on the information in the manifest. Then, if the security requirements are met, the CLR performs just in time (JIT) compilation to convert the IL code to native machine instructions. The CLR also provides other services related to automatic garbage collection, exception handling, and resource management. Code that is executed by the CLR is sometimes referred to as "managed code," in contrast to "unmanaged code" which is compiled into native machine language that targets a specific system. 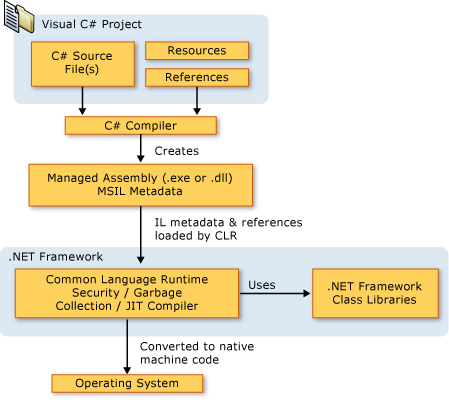 The following diagram illustrates the compile-time and run-time relationships of C# source code files, the .NET Framework class libraries, assemblies, and the CLR. Language interoperability is a key feature of the .NET Framework. Because the IL code produced by the C# compiler conforms to the Common Type Specification (CTS), IL code generated from C# can interact with code that was generated from the .NET versions of Visual Basic, Visual C++, or any of more than 20 other CTS-compliant languages. A single assembly may contain multiple modules written in different .NET languages, and the types can reference each other just as if they were written in the same language. In addition to the run time services, the .NET Framework also includes an extensive library of over 4000 classes organized into namespaces that provide a wide variety of useful functionality for everything from file input and output to string manipulation to XML parsing, to Windows Forms controls. The typical C# application uses the .NET Framework class library extensively to handle common "plumbing" chores. Here are some expressions commonly used in discussing family and relationships matters.